High school students across the country are once again getting a shot at designing their very own Vans sneakers, and you can play a deciding factor in which entry makes it to production. 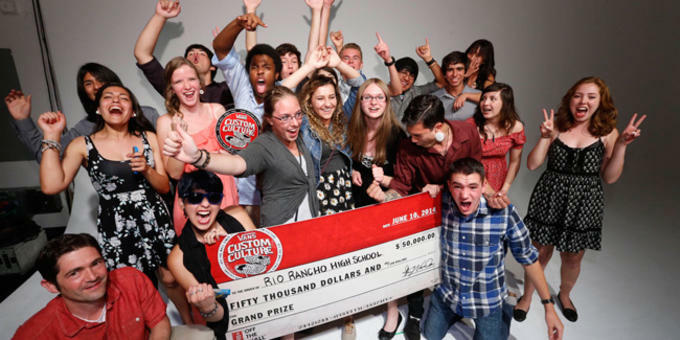 After narrowing down over 2,500 submissions for its Custom Culture Competition, Vans has selected 50 semifinalists that will have the chance to win $50,000 for their school&apos;s art program and eventually see their sneakers sold on shelves. Each school worked with four classic Vans silhouettes: the Authentic, Classic Slip-On, 106 Vulcanized, and Sk8-Hi, adding personal touches inspired by art, sports, music, and their respective locales. To commemorate this year&apos;s event, Vans has released a pair of Authentics from the 2014 winners, Rio Rancho High School. Inspired by southwestern vibes, these feature a vibrant geometric pattern throughout the front panel and imagery of a desert landscape on the heel. Proceeds of sales from these Authentics will go to Americans for the Arts. The Vans Custom Culture Authentics are now available online for $55, while voting for this year&apos;s semifinalists is open now through May 11. Check out the field here and get your vote in to decide who moves onto the next phase.